It is our greatest pleasure, on behalf of the Organizing Committee to welcome you to attend the 3rd International Refining & Petrochemical Convention Vietnam 2017, which will be held on April 20-21, 2017, in Hanoi, Vietnam. Vietnam is set for a surge in refining and petrochemicals capacities in the next five years as investors seek to establish new operations in the Southeast country. Strong growth in end markets and Vietnam's position as a global manufacturing hub are driving production, although there are enduring risks associated with land acquisition and regulatory approval as well as regional market over-supply. Currently, limited capacity leads to a reliance on imports for domestic conversion and end-product manufacturing. With refinery developments in the pipeline, Vietnam will be able to increase capacities, particularly for polypropylene and ethylene in the medium term. However, slow land clearance and financing problems delay these projects, postponing capacity increases by a number of years. Aside from financing and land acquisition issues that have delayed refinery and petrochemicals projects in recent years, there is a danger of massive regional over supply that will push down prices in the long term. Externally, the industry is faced with the onslaught of cheap US based production flooding the Asian market, while it will be dependent on refineries for feedstock, which is likely to be more expensive than shale derived ethane. 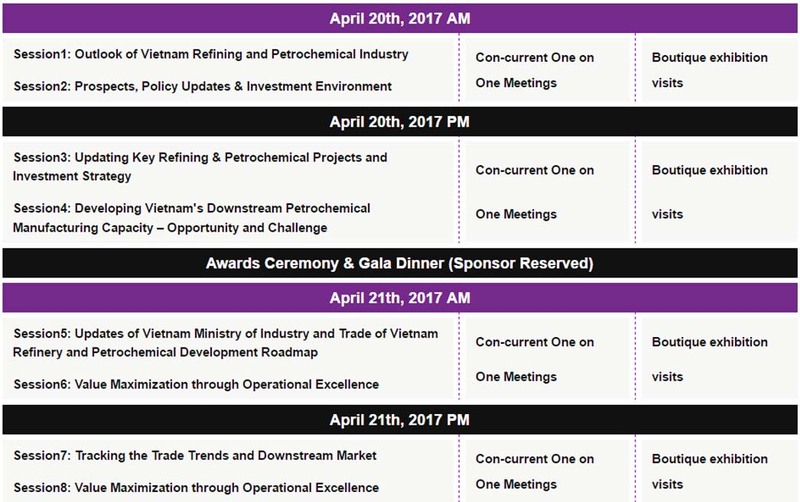 The 3rd International Refining & Petrochemical Convention Vietnam 2017, schedule from April 20-21, is a 2-day gathering of international experts from all over the world to share case studies, discuss opportunities and deliver solutions for the major challenges faced by the industry. It should be the ideal platform for refining and petrochemical companies/individuals to know the latest updates and explore partnership opportunities for staying ahead of the game. We look forward to your participation in 3rd International Refining & Petrochemical Convention Vietnam 2017.